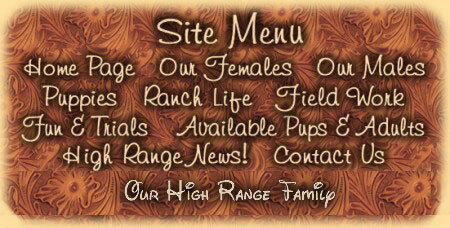 All High Range Pups and dogs are sold or adopted with a written guarantee for a variety of things. High Range pups and dogs leaving here for their new homes are vaccinated, de-wormed, parasite prevention, micro-chipped, usually BAER tested for hearing and have recent normal veterinary exams. If you have a serious inquiry about available pups, dogs or planned breedings and we have not answered your e-mail or call, please keep trying. Our busy life sometimes delays our response to many inquiries. We are happy to answer all questions. 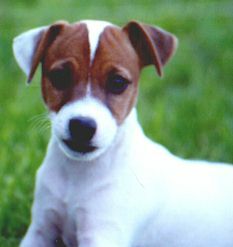 We welcome visits to meet us and our High Range family of JRTs. 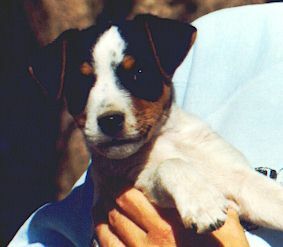 Raising Jack Russell puppies from birth is our greatest pleasure. 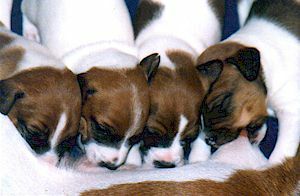 Breeding Jack Russell pups is our greatest responsibility. 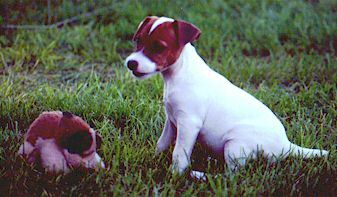 We aim to maintain the breed integrity for the unique Jack Russell, and continually improve the genetic constitution, conformation, health, temperament and hunting instincts of this breed. 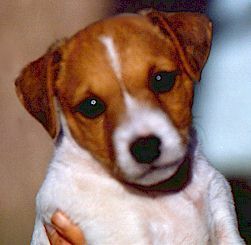 We intend to be responsible for our High Range terriers from conception until the end of their lives. All of our pups are guaranteed in writing. We will always take our dogs back for any reason. 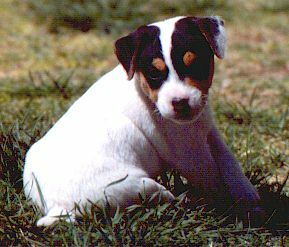 All of our breeding dogs are JRTCA registered, BAER tested normal (for hearing) and are CERF tested annually (for eye problems). 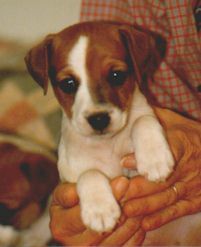 As a member of the JRTCA Breeders Committee and an officer of the JRTCA Research Foundation, we take seriously our adherence to the JRTCA Breeders Code of Ethics. Our pups are whelped and raised inside our home with lots of comfort, interaction, and nonstop hugging. 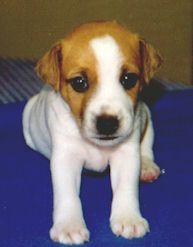 We do not part with any pups until 8 to 10 weeks of age. 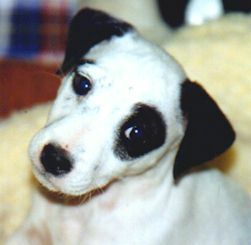 We recommend that people who seek breeding and show prospect pups wait until the pup is at least 12 weeks old. In Loving Memory of High Range Spot. Dr. Currie DVM. High Range Topper is still a dollface. 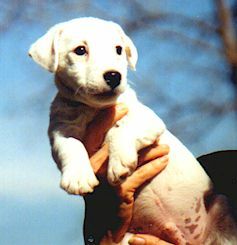 High Range Fling at 6 weeks. Count the pups. Seven fine pups in this litter. 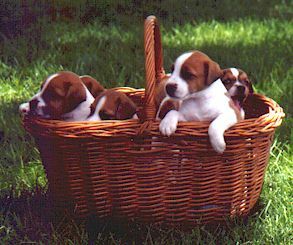 They stayed in the basket for one second! Shine x Luke Tussle now works for RCA Victor. 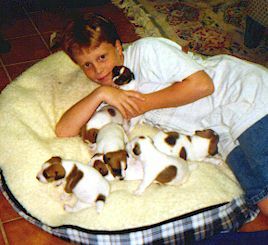 My best pal Nicholas Segal enjoys Bonnie's seven fine pups. 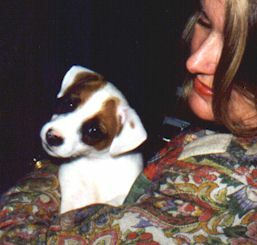 Calm, loving mothers help produce calm, loving dogs. 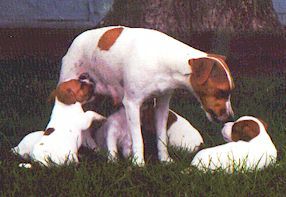 Here my all-time favorite JRT, Westwood Bonnie, with her pups. He has learned to work cattle with Border Collies. Hustle as a tot. His eyes look deep inside you. How sweet the sound and smell of nursing pups! 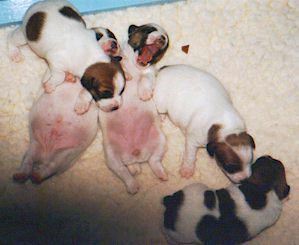 Two pups had so much milk in their tummies that they were "beached" on their backs! 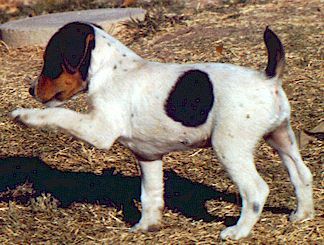 High Range Topper at 8 weeks. 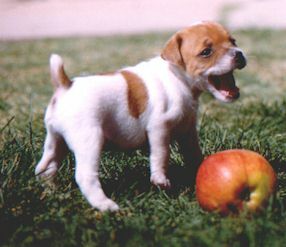 Is there anything cuter than a Jack Russell pup?